As usual, I have lots of ideas for sewing projects. Most of the time I may complete one or two for a particular month. So I have decided on three projects. First project and already started is Jalie 3890 Mimosa Top. 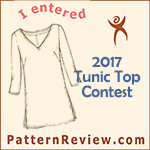 This is a versatile top pattern; it has three sleeve variations. I plan to make the long sleeve with flounce top. 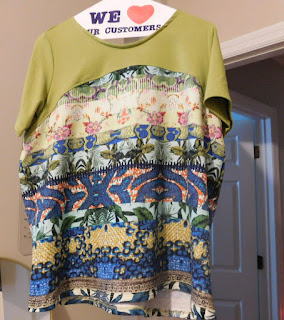 I am using a print fabric that is peaking out behind the pattern as seen above. 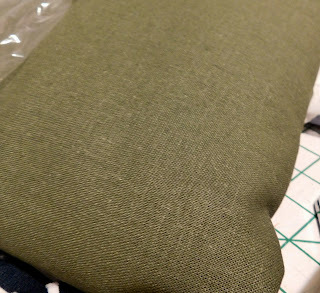 I also have a solid blue fabric piece that I am considering for the flounce. My second planned project is an Ellie and Mac pattern called the Undercover Hoodie. 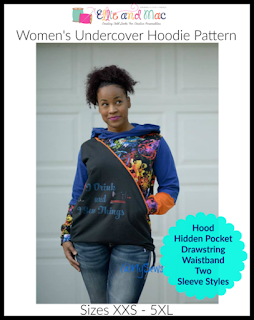 I like the look of this hoodie and will allow me to mix and match some leftover fabrics. My final planned project is the new Fulton Sweater Blazer. 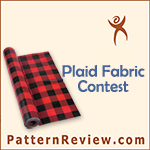 I have several medium/heavyweight fabric that I think will be perfect for this. I have printed, taped and traced the Jalie pattern. Next is to pin fit the traced pattern for additional adjustments. I have reduced the length of the front and back bodice by one inch. I made a 5/8 inch swayback adjustment; my usual. After pin fitting, I will most likely have to do a forward shoulder adjustment and maybe/maybe not FBA. My current plan is to do the fitting this afternoon and cut out the fabric. Hope your weekend is going well. Updates to follow. I'll be curious on your opinion of the Fulton! I love that collar! I like that collar too! I see a lot of this style collar on TV on female anchors or talk shows. 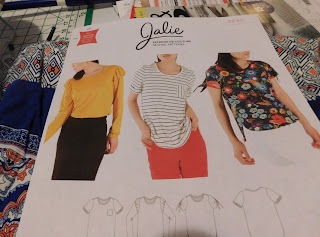 I purchased the Butterick jacket pattern with this collar also. Such great choices! The Mimosa top with the flounce is so cute! Also, that Fulton blazer...WOW! I am so in love with the notched collar feature popping up everywhere. I think there were a few patterns in the Ottobre Woman from 2018' that had that detail. I am excited to see how yours turn out. I will really love the updates from your projects as I have gone through few of your projcts before and really enjoyed reading them all.